To be the very best in Pokémon: Let’s Go, Pikachu!/Pokémon: Let’s Go, Eevee!, one must not just become the Champion of Kanto, they must become the Pokémon Master that stands tall over all others. First and foremost, in order to even begin your journey to become a Melmetal Master, you must catch enough Meltan in Pokémon GO that you wind up with enough Meltan Candy (400) to evolve the Meltan of your choice. 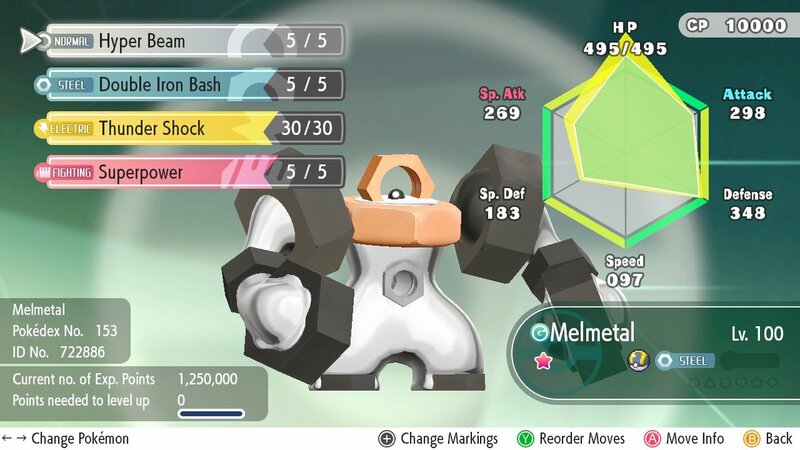 You will also need to transfer Melmetal to your Let’s Go game and catch it in-game. Once you do possess a Melmetal however, it is time to get the long process underway. Much like Mew, Melmetal will require a CP of 8,000 to earn the title, which means, you will need to feed your Melmetal as much candy as you can and level the Pokémon to level 80 or higher. So, combo catching Chansey is certainly a good way to speed up the process. Tags: Feature, Game Freak, Guide, Melmetal, Melmetal Master, Nintendo Switch, pikachu, Pokémon Let's Go!, Pokemon: Let's Go Eevee!, Pokemon: Let's Go Pikachu!